In the heart of Renaissance Italy, on the Tuscany/Umbrian border, high on 400mt ridge, stands "Podere Borgacciano", 3km. from Monterchi, a medieval walled village (see Thames & Hudson's 'The Most Beautiful Villages in Tuscany'). Opens late in APRIL and closes late in OCTOBER. table and chairs, Barbecues and Pizza Forno, from which to enjoy al-fresco meals with stunning views across the valley. Mediaeval Lippiano Castle and the lush green Umbrian Hills form a backdrop. We installed the finest pool equipment from the USA made by Culligan. The Diatomea Filter(Fullers Earth)filters out all particles over 0.50 microns. (The average Sand filter, filters out particles over 30 microns, making ours 60X more efficient) The Chlorination and Ph levels are computer controlled. Our groundsman cleans the pool and checks water quality weekly. An electrically controlled pool cover for insulation and safety is installed. The 14 mtr infinity edge allows you to feel as if you are swimming in the valley whilst listening to your favourite music from the outdoor speakers. The cantina is NEVER rented independently. Monterchi, its name derived from 'MONS HERCULIS' (hill of Hercules) whose cult was celebrated here in ancient Etruscan and Roman periods, is home of the famous Renaissance fresco 'The Madonna del Parto' (The Madonna of Childbirth) The mother of Piero della Francesca, the painter of the fresco, was born in Monterchi and the village became famous when in 1888 the fresco, painted in 1446 and considered one of Piero's finest masterpieces, was uncovered in the chapel of the cemetery. This restored fresco is now well displayed in the old village schoolhouse. SIGHTSEEING: Podere Borgacciano is a 'Springboard' for sightseeing. Florence (130 kms); Siena (90 kms);San Gimingnano (110 kms.) Assisi (75 kms) Pisa (150 kms); Perugia (65 kms); Arezzo (30 kms) (all distances approx.) are within easy reach. Rome, Bologna, and the Chianti wine countryside are within one to two hours travel. Both the Mediterranean and Adriatic coasts are no more than 2 hrs easy travel. Local pearls such as Sansepolcro, Citta di Castello, Gubbio, Urbino, Anghiari, Caprese Michaelangelo (the artist's birthplace) and many more, abound with culture, art treasures, music and folk festivals. 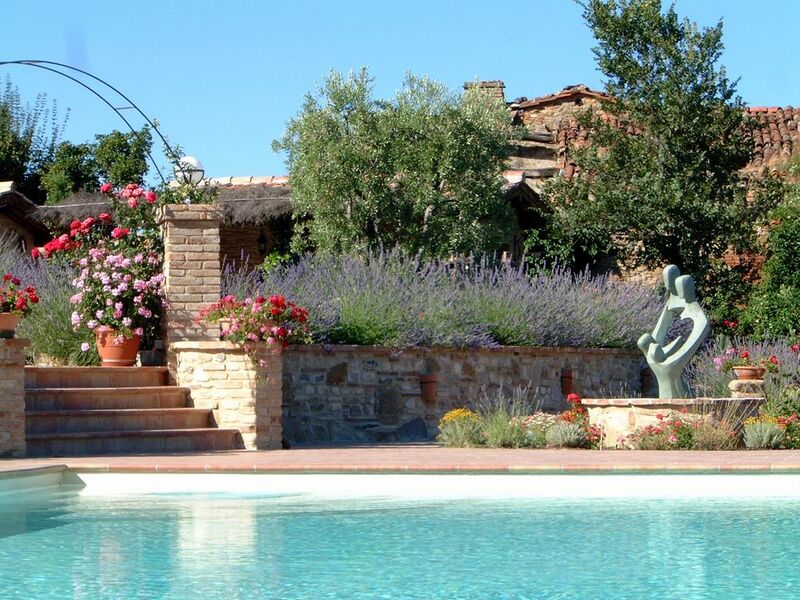 Podere Borgacciano is not a 'holiday home,' but our home in Italy. A magnificent 50 sq.mt kitchen/eating/living area with breathtaking views down the valley to Monterchi, the Tuscan hills and range upon range of the Appenines. There are three bedrooms, one with a large double bed and the other two with twin beds. Every bedroom has air conditioning and an en-suite bathroom with shower cubicle/bidet/WC/vanity unit and hair-dryer. 2 en-suites also have a bath. 2 of the bedrooms have French Windows to terraces. We have many terraces at different levels some shaded with pergolas and others in full sun. There is a full library of books & videos. We offer you, our guests, our Estate bottled Chianti and help yourself to the ripe home grown produce that our gardener Pino lovingly tends. There are tomatoes, onions, garlic, basil, parsley,mulberries,plums,apricots, figs,walnuts and almonds which ripen through the Summer and Autumn. We look forward to welcoming you to our 'angolo di paradiso'. FOR MORE DETAILED INFORMATION AND MORE PHOTOS PLEASE CONTACT US.